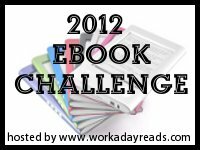 Welcome to the August round-up for the reviews for the 2012 Ebook Challenge. Before you enter your reviews in the linky tool below, ensure you have signed up. With the blog move from Blogger to WordPress this week I didn’t get a prize lined up. But you guys are doing great without carrots anyway. I did not enjoy this book. Jess Harper, the main character was so self-centered, shallow and mean at times. She is supposed to be a professional, she gets a chance to go Japan and lies in her interview that she speaks Japanese. That doesn’t sit well with me! When she gets there, bad things happen like her boss claims her designs as his own. It doesn’t make any sense when this one dimensional character learns begins to appreciate Japan for its beauty and differences. I was still mad at her for treating everyone so bad at the beginning. There just was not that much about Japan. I did like that the grammar was fine and there were no mispelled words and also the cover is a cute in a way. I would not recommend this book, I did not like it. I look like I read a lot of books this month, but more than half were short stories. Hehe! I read several new to me authors and now have some new favs.